-Check out Alex’s Reverbnation Page. Listen to some tunes and fine some cool stuff! Thanks again for all your support! We couldn’t do it without you! On Saturday Jan. 16, I had the great opportunity to perform for WMNF’s Accordion Jam. The Jam was a benefit for Wackie Jackie’s Polka Party Express radio show at the Polish American Pulaski Club in Holiday, FL. A full house was on hand to hear Walter Kasprzyk, Bob Turcola, Joe Oberaitis, Tony Lovello, the jammers and me play. It was an absolute blast. All of the featured accordionists got enthusiastic receptions, despite their varied styles and repertoires—the type of events I really like to participate in! Personally, it was a blast to play with Joe again, as it’s been over a decade since we played together both in Joe’s band (where I was the drummer) and my Dad’s band (where Joe was the drummer). We played a duet on “Tanzende Finger” (from my latest “Stay All Night” CD) as well as the Eddie Habat classic- “Go Man Go”… Finally, I got to play trumpet on one of Joe’s old hits- “Crumbling Heart”. Good times! I hope to have the opportunity to see more of the people from Tampa area on Sunday Jan. 24 when I will be performing, with Wackie Jackie on drums, for the Suncoast Arts Festival. For more information, check out www.suncoastartsfest.com. 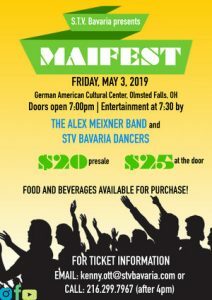 Mrs. Wackie and Wackie will be on hand for a live radio broadcast as well as the performance by the Alex Meixner Duo.